It’s not a place, exactly. But it could be NASA’s next destination. The late summer of 2011 was an awkward moment for NASA’s 50-year-old spaceflight program. The space shuttle’s final mission had just ended, and construction of the International Space Station—the shuttle’s signature achievement—was complete. Instead, he set a new goal—sending astronauts “beyond the moon,” to an asteroid by 2025, then on to orbit Mars by the mid-2030s. Critics who accuse NASA of having no destination for human spaceflight couldn’t be more wrong, according to the agency. “The ultimate destination is to send people to the surface of Mars,” says Doug Cooke, who in 2011 was NASA’s associate administrator for exploration systems (he is now an independent aerospace consultant). The choice of Mars is clear, in part, because anything more ambitious is simply beyond today’s technology. “That’s about as much as we know how to do,” says Cooke. But as Cooke and everyone else in the NASA hierarchy well knew, we’re not ready for Mars. So the task in 2011 was to plan out the intermediate steps. NASA had been mulling an asteroid mission for years (see “The Million-Mile Mission,” June/July 2008), but as the studies got more detailed, difficulties arose. It became apparent that there were very few good targets to visit in the 2020s. NASA needed an asteroid that was both reachable and “interesting.” Interesting, in scientific parlance, meant “something big enough to have some diversity of features, at least 60 or 70 meters in any dimension,” says Cooke. That more meaningful something emerged during 2011 in a proposal known as Gateway. The mission: Send astronauts to an empty spot in space, high above the lunar far side, where the gravitational pulls of Earth and of the moon are balanced. Such spots are called Lagrange points; the one in the Gateway proposal is Earth-moon Lagrange 2, or EML-2 (see “The Lagrange Points,” p. 27). 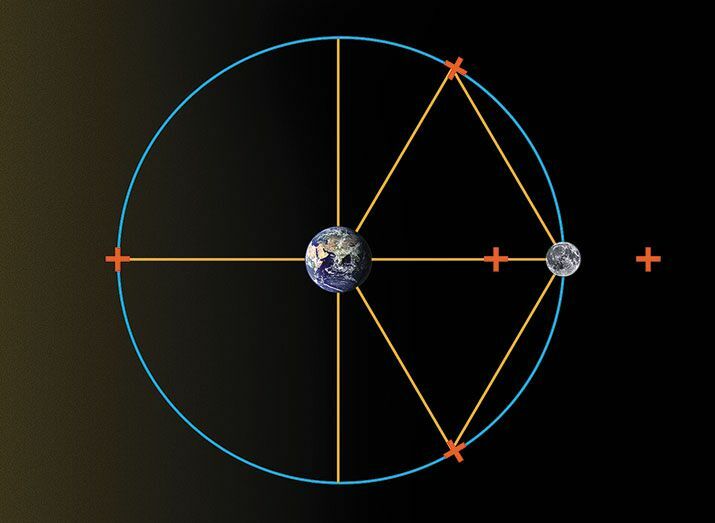 Circling this spot in a “halo” orbit, an astronaut crew would remain effectively parked in zero gravity, flying in formation with the moon as it orbits Earth every 27.3 days. At the L2 point, astronauts could learn to work in deep space. They could joystick a robotic rover to explore the craters, hills, and valleys of the lunar far side, 40,000 miles away. They could use the rover to deploy a sensitive radio telescope that would be shielded from terrestrial interference. Biologists could gather critical data on the dangers of galactic cosmic rays, which can increase the risk of cancer, to future deep space travelers. Eventually, the L2 point could serve as a staging site—a gateway—for missions to asteroids and to Mars. Although NASA has been studying Lagrange-point missions for at least a decade, the idea gained new momentum in August 2011, when William Gerstenmaier, NASA’s associate administrator for human exploration and operations, created a special working group to examine NASA’s human spaceflight options. Affordability was a primary requirement, and for space mission planners, a sure way to lower launch costs is to cut down on the consumable supplies, especially fuel, a crew needs to take along. A principal advantage of any Lagrange point is that once a spacecraft arrives, very little energy is required to keep it there. “I’m using the gravity properties to minimize the fuel requirements,” Gerstenmaier says. The L2 point is about 15 percent farther than the Apollo astronauts traveled. The quickest way to get there—in only three to five days—is to use the Apollo approach: take aim and fire. This, however, requires extra fuel. So NASA would prefer to take a slower and more circuitous route, using a gravity assist from the moon to hurl Orion to its destination. By early last year, Gerstenmaier’s in-house NASA group had worked up a PowerPoint prospectus on a Gateway mission, emphasizing its value as a training ground for deep space. Astronauts would gain critical experience operating their spacecraft in a new and unfamiliar environment beyond Earth orbit, would use dosimeters to monitor radiation levels, and would work more independently of Earth-based controllers. 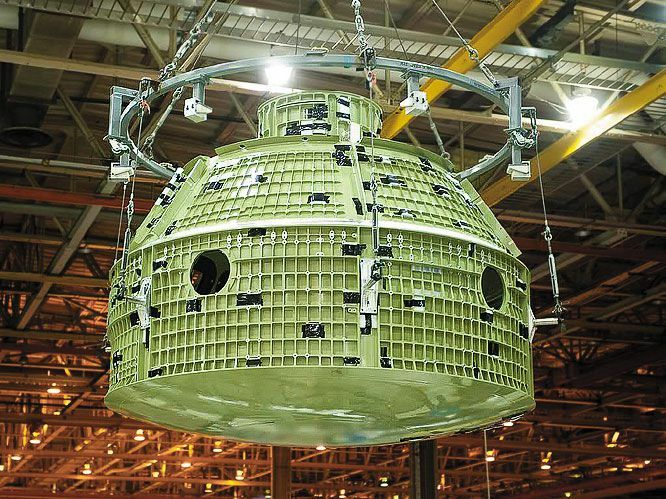 All this could be done from Orion, which will be about two and a half times roomier than the Apollo spacecraft and weigh nearly 11 tons, almost twice Apollo’s weight. 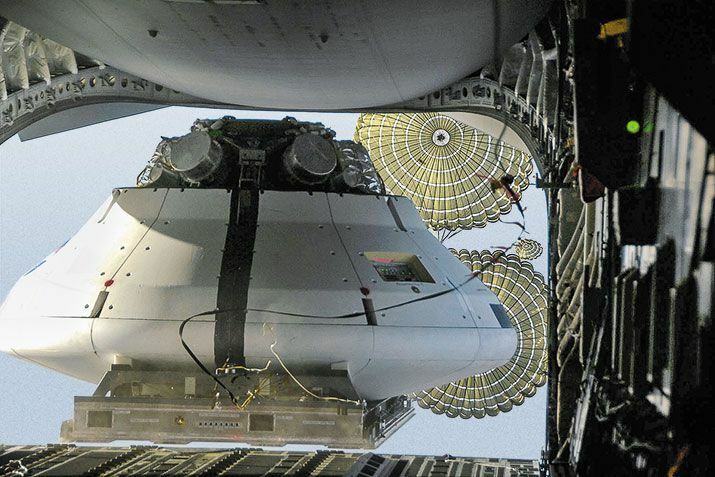 With its European-built service module, it will carry four astronauts instead of Apollo’s three. Besides mastering the orbital mechanics of deep space, the Gateway astronauts would have work to do. In a recent paper for the journal Advances in Space Research, the Burns group described some possibilities, beginning with a first-ever comprehensive robotic exploration of the far side of the moon. This mission would begin with the landing of an unmanned rover in the South Pole–Aitken basin, a favored target for geologic exploration because it offers a broad swatch of lunar history. The basin includes some of the oldest rocks on the moon, but there also is evidence of more recent volcanism. Orion, with astronauts on board, would arrive at L2 after the rover lands. With a signal delay of only 0.2 second (it takes about two seconds for a signal to travel from Earth to the moon), astronauts could steer the vehicle in near-real time. “We’re talking about a surface rover that can move kilometers in a day instead of meters,” Burns says. Astronauts could also use the rover to deploy an array of antennas for a radio telescope. Shielded by the moon from Earth-generated radio interference and ionospheric distortion, the far-side telescope could examine the formation of the first stars, 85 million to 250 million years after the Big Bang. If the Gateway outpost were to grow, the Burns group has thought about placing a storage depot there, “something modest, stocked with consumables,” he says. Astronauts would have extra lab space and “more room to maneuver,” he adds. 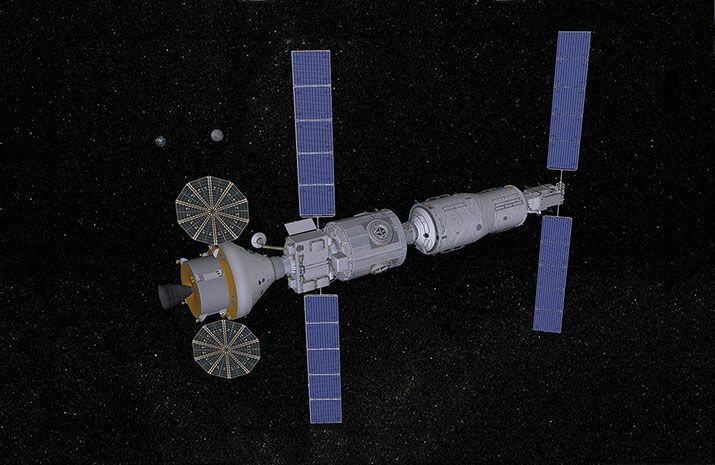 Orion could dock with the depot and have a small, reusable lunar lander berthed there. Burns says the depot would most likely use modules similar to those on the space station. Meanwhile, the planners keep planning. Maybe the most dramatic use of an L2 outpost is one proposed by the Keck Institute for Space Studies in cooperation with NASA’s Jet Propulsion Laboratory in California. They describe a mission in which a robotic spacecraft chases down a schoolbus-size asteroid, captures it, and brings it to the vicinity of the moon. There, astronauts could practice spacewalking around a small asteroid, extract water to make rocket fuel, and take inventory of its minerals. “The gut feeling is that we like L2, but it turns out that if an object is at L2 and let go, it will be unstable and could drift away” and possibly crash to Earth, Friedman says—although an object as small as this 23-foot-wide asteroid would burn up in the atmosphere. One problem is finding the right asteroid, he says. There are “millions out there,” but NASA and its international partners would need to set up a dedicated program to shop for candidates of the right size and type. The robot spacecraft would approach the asteroid, match its tumbling motion, and use a soft, inflatable bag in the spacecraft’s nose to grab it. Then the spacecraft would “de-spin” the asteroid and bring it near the moon. The entire capture mission would take anywhere between five and a half and 10 years, depending on the asteroid’s initial orbit and its mass. 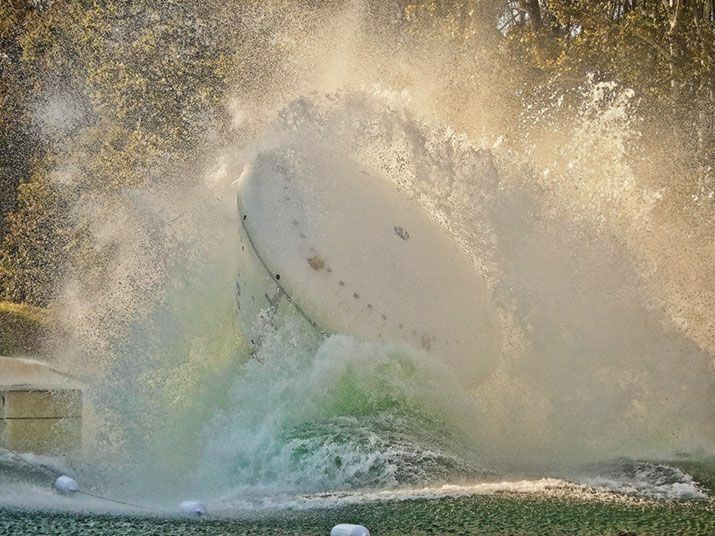 As of early this year, NASA has not committed to an L2 mission. “The Lagrange points are very intriguing to us,” Gerstenmaier says, but adds that Gateway might turn out to be more challenging than it seems. “We need to know if there are too many unknowns. Am I not pushing hard enough? Or am I pushing too hard?” The most likely message to NASA from space enthusiasts? Push. Guy Gugliotta, a former science reporter for the Washington Post, is the author of Freedom’s Cap: The United States Capitol and the Coming of the Civil War (Hill and Wang, 2012).